A still life portrait is a still life in which every object is used to make up a symbolic portrait of a person (or a couple, or a family, etc.). 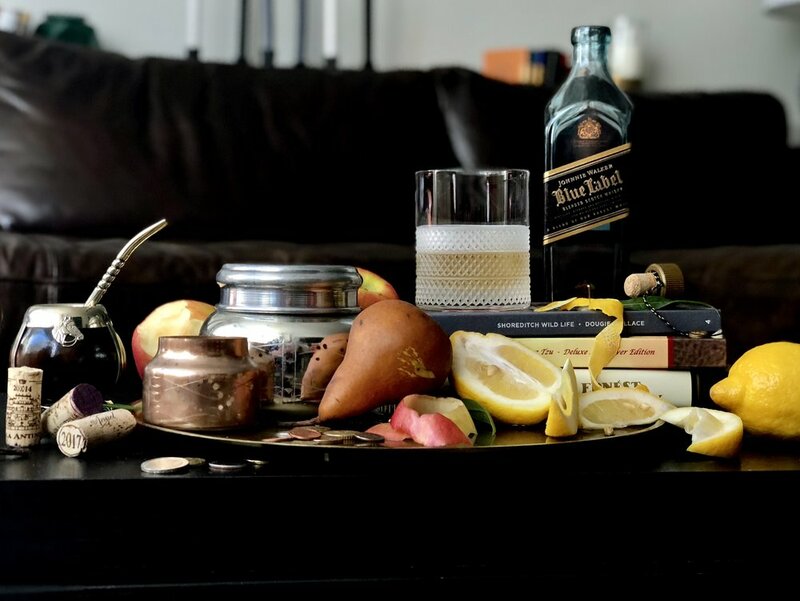 I see this as a play on the still lifes of the Dutch Golden Age & the Vanitas movement, but I want to modernize it. Rather than using these still lifes to communicate the transience of life, I want to use it as a way to immortalize life. 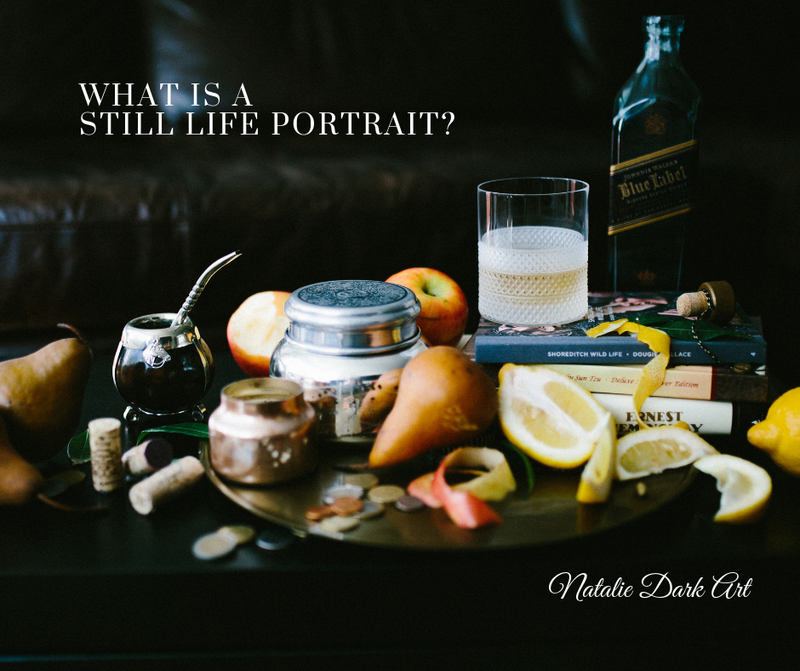 Still Life Portraits are a way for us to go beyond the “selfie” and the surface image we show to the world. This is an opportunity to communicate our existence on a deeper level. My husband’s still life portrait is the first I have ever arranged. I made it only of objects we have in our home, and fruit I could easily source at our local grocery store. The portrait is highly personal, and it is my rendition of my husband. It is how I see him. The objects go beyond things he likes, and reaches into memories I have and symbols of how I view my husband in our daily life. I wanted this piece to be a snapshot of how I see him now, at this point in our lives together. There’s lots of him that is missing from it, but I wanted to preserve the part of him that I see every day, right now, before life changes again (as it always does!). 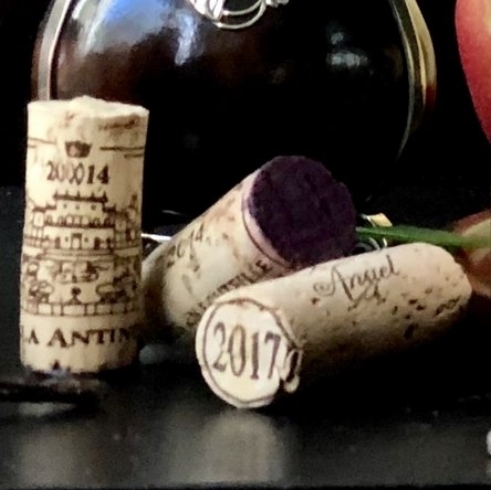 Below I explain a few of the stories behind why I chose certain objects to be included in Jason’s still life portrait, but I don’t explain them all, because a lot of it is pretty personal & he is a pretty private guy! One of my favorite stories about my husband as a child has to do with pears. He was about 9 months old & in his grandmother’s kitchen repeating the word “da-da” (distinct pronunciation from Dada). His grandmother tore the kitchen apart trying to figure out what Jason was asking for, but he just kept repeating the word “da-da” & looking at her in frustration with every item she pulled out of the cupboards. If I remember the story correctly, Jason made a point of indicating that the “da-da” was in the refrigerator, so his grandmother opened it up & let him rummage. Jason instantly pulled himself up, opened a drawer, pulled out a pear and shoved it at his grandmother saying “da-da!” If you know Jason, then you will have no problem believing me when I say that at 9 months old he was calling her an idiot in his baby brain for not knowing what a “da-da” was. 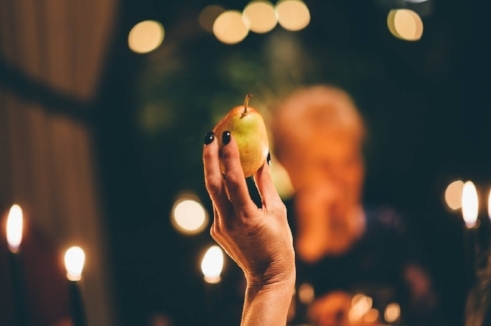 Well, at our wedding we had pears at each place setting & it was completely unintentional. However, you better believe that it turned into a story his grandmother told to all of us sitting at the table & ended with a “da-da” toast! It couldn’t have been more perfect if we had planned it & pears will always be a special fruit for me when I think of Jason. Speaking of our Argentinian honeymoon, note the traditional Argentinian tea cup & straw (Mate is the name of the tea, and the gourd and bombilla are the cup and straw). It was the only thing Jason wanted to bring home from our honeymoon, even more than wine! His interest in Hispanic culture started long before we met, and he is even fluent in Spanish (no thanks to me! ), so this cup is not only a symbol of our honeymoon, but more importantly, it is a symbol of Jason’s interest in Hispanic culture. Shoreditch is a neighborhood in London where Jason & I lived for a few months. It was not where we lived for the majority of our time in London, just a few months at the very end, but it was the most memorable. We moved to Shoreditch after finishing our master’s degrees & while Jason was interning at a bank in London. Our lease in the posh Bloomsbury flat was up & couldn’t be renewed for such a short period of time (just 4 months), so we were scrambling to find anything we could with a very restricted budget! Shoreditch is definitely one of the cooler, hipper neighborhoods in London. It is kind of like Williamsburg in NYC, except much older & well established. However, Shoreditch was much more legit than Williamsburg in the sense that it was still affordable & still kind of sketchy…Well, you do what you gotta do to make things work, and so we moved into a flat share with one bathroom and 3 strangers. If you haven’t figured it out by now, we are NOT the typical Shoreditch resident, or even visitor. It was a cool 4 months of people watching, and we bought this book while we lived there because it PERFECTLY describes the neighborhood…Shoreditch WILDLIFE. One of my favorite things about our relationship is that we are both always up for an adventures & our motto has always been “just make it work.” Shoreditch was absolutely an adventure & we definitely made it work. Is a still life portrait something you would be interested in commissioning for yourself or someone you love? What are some objects you would include in it? Let me know in the comments section below!